​The interactions in a child’s earliest years are critical to future success in learning, social competency and prevention of mental health problems. The social-emotional development that takes place during this time is strongly influenced by the quality of the relationship between young children and their primary caregivers. This importance has been recognized in Nebraska both by public and private studies, planning efforts and initiatives. 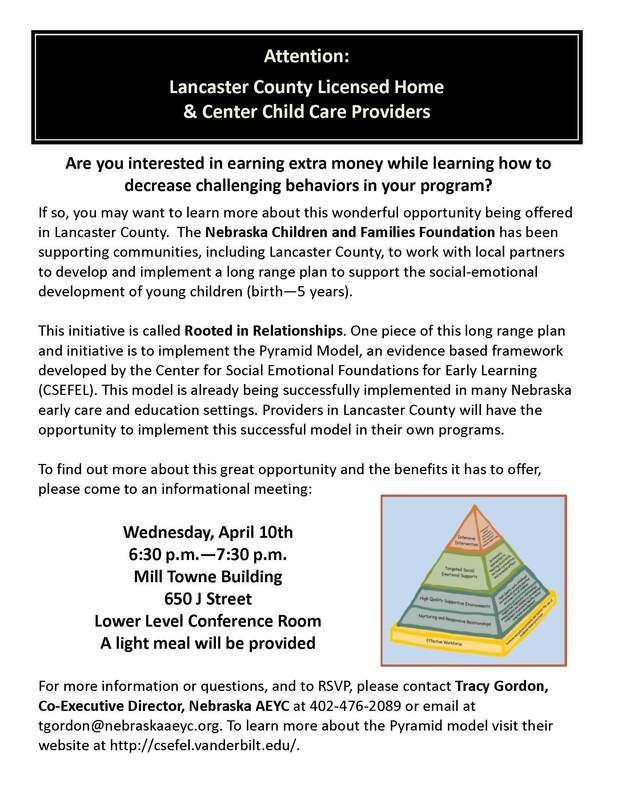 Nebraska AEYC partners with Nebraska Children and Families Foundation to bring the Rooted in Relationships Pyramid Implementation Project to 11 center based classrooms and 1 family child care home in Lincoln and Lancaster County. The project includes professional development and individual coaching for child care providers, individual child assessment, and access to grants for additional social-emotional development materials. As new projects are added, applications for participation will be posted on this page so please return frequently for updates and additional information. We invite you to join us for an informational meeting about the Lincoln/Lancaster County Pyramid Implementation Project. Hear about how you can support the social emotional development of the young children in your care AND earn extra cash by participating in this exciting project!